Isiah Factor | The Insite » POLICE CHIEF FIRED IN HEMPSTEAD, TEXAS! 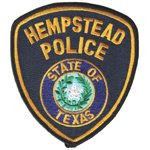 POLICE CHIEF FIRED IN HEMPSTEAD, TEXAS! March 21, 2008 | Posted in Uncategorized | Comments Off on POLICE CHIEF FIRED IN HEMPSTEAD, TEXAS! ALLEGATIONS OF RACISM AND BAD POLICE WORK – DID IT COST HIM HIS JOB? The Insite received a call from a Hempstead, Tx. resident who was delighted to tell me the Police Chief in the small Texas city has been fired. That chief is Glen Smith. I put in a call to the Mayor of the city who responded only a few hours later. Michael Wolfe said the city council fired the police chief on Monday after a vote of no confidence. Sources say the council gave Smith the opportunity to resign but he opted to hang in there and get fired. Residents have made several complaints against Smith alleging racism and bad police work. But Mayor Wolfe said there was no one specific reason he tell me why the Chief was terminated from the city. As of Thursday afternoon the Insite was not able to track down Smith for a comment. I also hear he is considering a run for Sheriff in Waller County!